Motion capture and live action are blended for Mowgli, a new, big-screen, 3D adaptation of Rudyard Kipling’s classic The Jungle Book. The story follows the upbringing of the human child Mowgli, raised by a wolf pack in the jungles of India. As he learns the often harsh rules of the jungle, under the tutelage of a bear named Baloo and a panther named Bagheera, Mowgli becomes accepted by the animals of the jungle as one of their own. All but one: the fearsome tiger Shere Khan. But there may be greater dangers lurking in the jungle, as Mowgli comes face to face with his human origins. The actors performing the roles of the story’s central animal characters are: Christian Bale as the cunning panther, Bagheera; Cate Blanchett as the sinister snake, Kaa; Benedict Cumberbatch as the fearsome tiger, Shere Khan; Naomie Harris as Nisha, the female wolf, who adopts the baby Mowgli as one of her cubs; and Andy Serkis as the wise bear, Baloo. On the human side, Matthew Rhys is Lockwood; Freida Pinto is Messua; and young actor Rohan Chand will play Mowgli, the boy raised by wolves. Rounding out the cast are Peter Mullan as the leader of the wolf pack, Akela; Jack Reynor as Mowgli’s brother Wolf; Eddie Marsan as Nisha’s mate, Vihaan; and Tom Hollander as the scavenging hyena, Tabaqui. 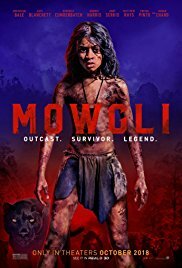 Mowgli is produced by Steve Kloves (Fantastic Beasts and Where to Find Them), Jonathan Cavendish (Breathe, performance capture producer on Godzilla), and David Barron (the Harry Potter films), with Nikki Penny serving as executive producer. The screenplay is by Kloves’ daughter, Callie Kloves. Serkis’s creative filmmaking team includes director of photography Michael Seresin (War for the Planet of the Apes), production designer Gary Freeman (Tomb Raider) and editors Mark Sanger (Oscar winner, Gravity), Alex Marquez (Snowden) and Jeremiah O’Driscoll (Flight). The music is composed by Nitin Sawhney (Breathe). Mowgli comes to big screens in the UK on October 19th.